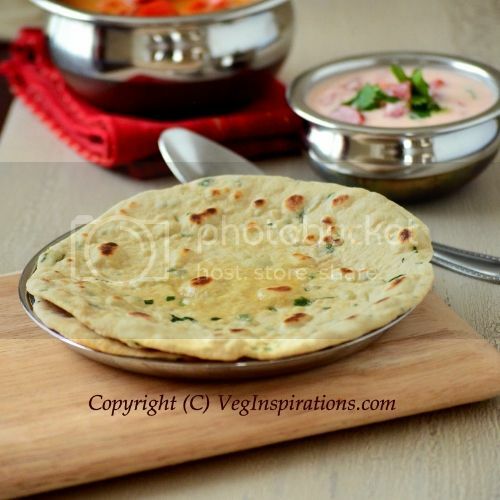 Kulcha is best described as soft leavened Indian flat bread. 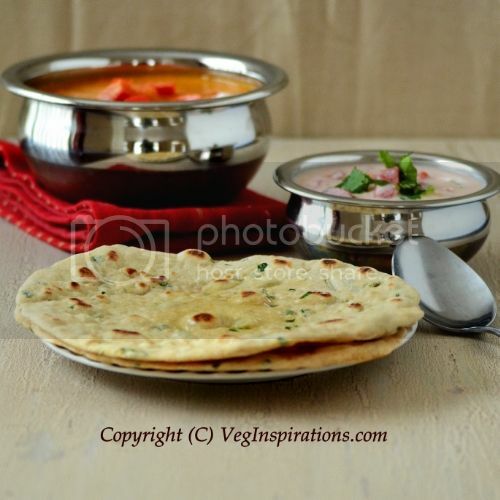 Kulcha is somewhat similar to naan, the main difference between the two is in the leavening. Whereas naan uses yeast to achieve its leavening, kulcha uses a combination of baking powder and baking soda. . Traditionally both naans and kulchas are made in a tandoor (clay oven) but both of these can be made on a stove top with pretty good results and of course both can be made in a conventional oven too. Ingredients and Method to make Wheat Kulcha. In a large bowl, add whole wheat flour, all purpose flour, salt, sugar, baking powder and baking soda and mix well. Add cilantro if using and mix again. Add yogurt and oil and mix into the flour. Add water as needed and knead into a soft and non sticky dough. I needed approx 1/2 to 3/4 cup for this quantity of flour. Keep the dough covered for about an hour. Divide the dough into 10 to 12 equal lime sized balls. Heat a griddle/ flat pan/ tawa on medium to medium high heat. Roll the dough with the help of a little flour into a circle of desired thickness. When the pan gets hot, place the rolled out dough on the pan and cook until there are small brownish spots on the lower side. Flip over and cook the other side until it has brownish spots too. Remove, apply butter/ clarified butter if you plan to use it and serve hot with a curry of choice. This flatbread tastes best when hot, so if all the dough is not needed, the balance can be stored in the refrigerator wrapped in a cling film and kulchas can be made fresh as needed.